The two new treble bells, increasing the light eight at North Stoneham, Hants, to a ring of ten, are to be dedicated on Sunday at 11 a.m. by the Rector (the Rev. T. Salmon). The bells have been given by Mr. and Mrs. George Williams to commemorate their golden wedding. This will be one of the lightest rings of ten in the country, the tenor being only 9 cwt. 26 lb. Since Winchester Cathedral bells were increased to twelve there has been only one ring of ten in Hampshire, namely, at Christchurch Priory, and these, if all goes well, will also soon be made into twelve, so that the addition at North Stoneham is not only an interesting personal gift from the first man and wife who took part in a peal together, but a timely augmentation for the Winchester diocese. NORTH STONEHAM’S PEAL OF TEN. MR. AND MRS. GEORGE WILLIAMS’ GOLDEN WEDDING GIFT. 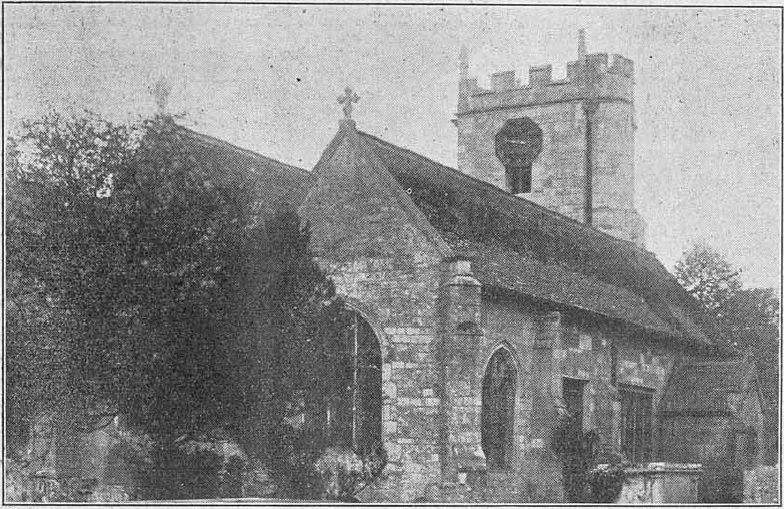 NORTH STONEHAM CHURCH AND TOWER, SHOWING THE VERY OLD ONE-HAND CLOCK. After the service, two courses of Grandsire Caters were rung by: G. Williams 1, W. T. Tucker 2, R. Paine 3, G. Pullinger 4, W. Edwards 5, W. Andrews 6, C. J. Fray 7, G. Noice 8, J. Hayward 9, E. Dumper 10. The tone and ‘go’ of the bells are perfect, and to ensure a correct ‘splice’ between the new and the old bells Messrs. Taylor and Co. recast the treble of the existing eight. This part of the work was generously done gratis by the firm. For evening service a course of Kent Treble Bob Major and three courses of Grandsire Caters were rung, ringing friends being present from Bishopstoke, Southampton and Winchester. North Stoneham now possesses one of the lightest rings of ten in the country. The peal at Loughborough Foundry, with a 6½ cwt. tenor, is the smallest. Cudham, in Kent, has another very light peal, and North Stoneham, with a tenor of only 9 cwt. 26 lb., comes next. The tower is built of stone, aid to have been brought from Quarr, near Ryde, Isle of Wight, in the fourteenth century. Six bells were placed in the tower by Messrs. Taylor and Co. in 1892, and they were increased to eight in 1909 by Messrs. Barwell, largely as the result of the efforts of Mr. Williams, who had raised a band at the tower. By this time ten peals of Minor had been rung. With the advent of the octave there was greater activity, and one after the other the standard and Surprise method were mastered, under Mr, Williams’ mature guidance, and peals rung. Indeed, North Stoneham tower has been known as the ‘Hampshire Ringing School,’ from the amount of instruction that has been given there. The one hundredth peal on the octave was rung on September 23rd, 1924, and many more have been added since. A new chapter in North Stoneham’s ringing history has now been opened by the further augmentation of the bells. SATURDAY, December 8th, dawned somewhat drear and drizzly, but in spite of such unwelcoming weather a large congregation gathered at the Church of St. Nicholas, North Stoneham, for the dedication of the recast bells. Of the 260 people who attended the service, about 60 were ringers from local towers and from places as far distant as Farnborough, Preston Candover, Salisbury, Bournemouth and Basingstoke. The service was conducted by the Bishop of Southampton (the Right Rev. K. H. Lamplugh). The Rev. S. C. Wincott (curate of the parish) acted as Bishop’s chaplain, and the other clergy present were the Rector the Rev. W. F. Shail), Canon H. D. Cæsar (Rural Dean of Southampton), the Rev. W. V. Lambert (Vicar of Eastleigh) and the Rev. K. W. H. Felstead. Also present was the Mayor of Eastleigh and members of the Borough Council. After the opening prayer and exhortation by the Bishop, the Te Deum was sung, followed by the lesson from the Book of Numbers read by the Mayor. The ringers’ hymn, “Unchanging God, Who Livest Enthroned in Realms on High,” was followed by the Creed and prayers for all benefactors, for the craftsmen and for the Guild. As the Bishop, preceded by the Rector and churchwardens, walked to the tower, another ringers’ hymn was sung, “Ring Forth, Holy Bells,” and with the congregation facing west, the dedication was carried out. Mr. J. P. Fidler, on behalf of the founders, handed the ropes to the churchwarden, who then handed them to the Bishop, asking him to dedicate the bells to the glory of God and for the use of His Church. At the end of the dedication ceremony the bells were rung in rounds by ten members of the local band - R. A. Reed 1, C. Murphy 2, A. M. Reed 3, Miss A. Vinter 4, C. Taylor 5, A. Smith 6, D. Forder 7, L. Stead 8, N. Hayes 9, J. L. Dacombe 10. Then the carol “Ding Dong! Merrily on High” was sung. When he thought of bells he thought of a friend of his, who every evening used to go to the local pub and on his way always met the Vicar of his parish. One evening, when he was starting his car, he heard the church bells ringing for Evensong, and it made him think of the Vicar. He thought: “That’s his life, and this is mine, but I wonder which is right in the eyes of God?” So he decided to go to church instead of to the pub that evening. Now he was one of the leading laymen in the Diocese. He felt he must congratulate the people of the parish, who had raised £320 of the £650 needed to pay for the bells. During the hymn “Angel Voices Ever Singing,” which followed the sermon, a collection in aid of the Bell Fund was taken, which realised £13. Finally, after the Blessing, the bells were rung again by members of the local band, followed by the first changes on the new bells - a course of Grandsire Caters by members of the Winchester Guild and the University Guild. Tea was provided by the Mothers’ Union, and about 100 people (the Bishop included) assembled in the Church Hall to partake of an ample meal, at 1s. 3d. per head, as a result of which another £5 6s. was added to the Bell Fund. The bells were rung to a variety of methods and a great many rounds until 9 o’clock, and the ringers went home satisfied that the bell founders had, as was to be expected, done a first-rate job, for the bells are now a most musical ring, the tenor being 10 cwt. 1 qr. 16 lb.